Starbucks weathered an unprecedented technical failure Friday… Matcha Madness coast-to-coast. Thousands of company-operated Starbucks locations in the U.S. and Canada experienced a catastrophic POS (point of sale) crash Friday that tested the coffee giant’s spirit of generosity. A momentary outage can be frustrating but with no word on when the system would be restored store managers recognized the opportunity to offer customers free drinks and food. When it became clear repairs would take hours, managers closed the stores. There is no estimate on how much this cost the company in lost sales, but Starbucks serves 54 million people a day. The outage was caused “by an internal failure during a daily system refresh and was not the result of an external breach,” according to the company which worked overnight to repair the system. By Saturday the more than 8,000 Starbucks locations that experienced the failure as well as Teavana and Evolution Fresh locations tied into the POS were open. Soon after the nation’s collegiate basketball frenzy passed newspapers and magazines coast to coast proclaimed “matcha madness” affording tea retailers a great opportunity to generate additional greenbacks from the emerald powder. The stir dates to late last year when the New York Times featured the 1000-year-old Japanese tea in an article on Ippodo Tea, an authentic Koyoto establishment that selected New York City as the site of its first store outside Japan. A stream of recipes and blog posts followed. This month TIME Magazine, the Associated Press and, here in Canada, the National Post all devoted major coverage to Westernized adaptations. When 300-year-old Ippodo Tea Co. of Kyoto opened in Manhattan in April 2013 it staffed the store with sommeliers trained in the Urasenke tradition of sharing. They eagerly explained and sampled matcha to the curious. Before long the small store front was crowded with afternoon office workers and weekend diners at the Michelin-starred Kajitsu restaurant. Tea drinkers must take their beverage to go as seats are reserved for dinner guests. The tea bar offers shaken matcha ($3.25) and a matcha slushy ($4.25) along with difficult-to-find Iribancha (a smoky tea originating in Kyoto). The subdued lighting, bamboo counter and merchandise on display reflect the Japanese view that matcha is a ceremonial drink shared quietly to facilitate meditation. Across the Pacific, Japan hasn’t been immune to the forces of cultural adaptation. “Matcha cake, matcha chocolate, matcha macaroons. Matcha sweets are everywhere,” Kenichi Kano, Ippodo’s international director told the Associated Press. In Japan Ippodo reported annual sales growth of 25%. MatchaBar is a western interpretation with a mission “to uplift and motivate our community with the power of matcha,” according to founders Graham and Max Fortgang. The Brooklyn shop opened last fall. The website www.matchabarnyc.com promotes the health benefits of matcha’s antioxidants, L-Theanine, catechins and EGCg. A 30-gram tin of classic matcha used in blends sells for $22 and the premium matcha taken “straight” costs $30. MatchaBar offers classes for $85 which includes a starter tin and bamboo whisk (chasen), ceramic holder and bamboo spoon. Shoppers can opt for the convenience of an Aerolatte Electronic Whisk. Brian Keating, principal at Sage Group in Seattle, published The Matcha Report (www.teareport.com) as a business resource for importers, formulators, chefs and manufacturers who see a big opportunity. “Over the last 20 years younger generations of Japanese bypassed matcha, replacing it with ready-to-drink carbonated soda, iced teas, coffee, and energy drinks,” explains Keating. “During this consumption shift within Japan, an eager North American and European specialty tea industry started to import more matcha and the word spread. Creative tea cafes began making concentrated matcha steamed with milk to create ‘matcha lattes,’” said Keating. Starbucks soon caught the wave placing it on menus nationwide where it became a daily habit. Hundreds of firms now offer matcha shakes, smoothies and matcha edibles. Click this link to see a Teavana sommelier demonstrate the traditional method of preparation. Keating cautions retailers that “as with any rising star consumer product, cheaper imitators started appearing over the last few years.” Most originate in China as powdered tea that lacks the brilliant green color and sweetness of Japanese matcha. Beware of “wholesale pricing far below the authentic Japanese matcha,” he said. Authentic matcha is produced from tea plants shaded for about 10 days before harvest. Leaves develop greater concentration of phytochemicals that deliver better flavor and texture. The finest are hand plucked steamed to halt decay and then dried and aged in cold storage, which deepens the flavor. Stems and veins are removed during drying and the tea is then pulverized in slow moving stone-grinders. The fine powder that emerges is measured in microns. This insures the full benefit of the leaf is ingested. Matcha has a distinctive, grassy flavor that reminds me of chewing on blades of alfalfa. It is rich in umami a sensation that westerners find appealing in moderation. The tea’s tannins can leave a bitter aftertaste which is why most served in North America is sweetened and blended with milk. Keating, who has followed the growth of matcha since 2005, believes it will continue to experience fast growth. 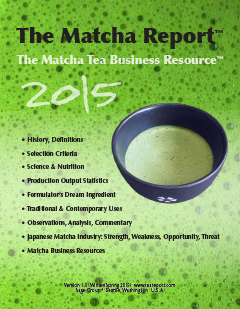 He documents his reasons in the 64-page The Matcha Report. “Matcha has yet to reach millions of consumers worldwide. When this untapped multitude begins to respond, a burgeoning specialty tea industry will benefit from the enhanced demand. Prices for authentic Japanese Matcha will inevitably rise — significantly — over the coming years, potentially placing a strain on supplies of the finest, ceremonial, and organic grades of the tea,” he said. Correction: Ippodo is located in the Manhattan Borough of New York City, not Williamsburg. Complaints mount as the Tazo transition to Teavana creates shortages… a $600,000 Pu-erh… Cold tea territory… Kumaon tea project funded … U.S. Tea Growers update…. Aly Weisman at the Business Insider complained about a shortage of any tea at Starbucks. “We’ve already switched over but we’re not receiving the supply to meet the demand,” she reported being told by a Starbucks employee in New York City after asking for tea at three different stores. She settled for a cup of hot water, paying 54 cents. Want a slice? A 375-gram cake of century-old Pu-erh is on sale this week from the collection of Six Mountains Tea Ltd., in Vancouver, British Columbia. The tea dates to 1910, according to tea specialist Erick Smithe. In this video he tells The Province, there are only 49 cakes remaining, all part of Kennedy Yeung’s collection. Yeung’s father is one of the foremost collectors of vintage teas, which like fine wines, improve with age. In 2013 a stack of Pu-erh cakes sold for more than $1 million per kilo at a Hong Kong auction. Brewing the first pot would cost around $150,000 Smithe estimates, largely due to depreciation that follows breaking up the cake. Even in winter America is cold tea territory. Annual spending is much greater for iced and ready-to-drink teas (62%) but hot tea, driven by the specialty category, continues to grow. In the U.S. last year hot tea accounted for 30% of the $4.2 billion in packaged tea sales reported by Nielsen MarketTrack. The category grew 4% last year largely due to pricing of specialty tea which sells for three times more than commodity tea. Sales of tea in single-serve capsules are growing in double digits. *Nielsen ScanTrack National US All Outlets for the 52 weeks ending Aug. 2, 2014. The growers are evolving from hobbyists into commercial specialists whose cutting-edge techniques will likely spread to the vast gardens overseas. Growers with at least 25 plants can join with some now cultivating tens of thousands. The object is not to produce millions of kilos typical of African, Indian, Malaysian, Vietnamese or Sri Lankan plantations. Instead “the U.S. grown tea movement is driven in part by the increasing market demand for specialty tea and the confidence given to small farm startups created by the ‘Farm to Table’, ‘Artisan’, ‘Buy Local’, and ‘Urban Food’ movements of the past decade,” said League President McDonald who owns The Great Mississippi Tea Company. “I am pleased with the gaining interest in the U.S. grown tea movement and think that this event gave the movement serious traction and direction going into the inaugural membership drive of the USLTG,” he said. The conference was attended by agribusiness experts and agronomists “the goal of the Roundup was to bring together farmers and aspiring growers to discuss estate operations, Federal, State, and University resources, and tea crop production issues. There was also an opportunity to network and liaison with various research projects already underway here in the USA, according to McDonald. Nigel Melican (orange) with USLTG members in Brookhaven, Miss. Growers from as far as Hawaii, Nevada, Michigan and several southern states attended including representatives from Alabama, Florida, Georgia, Kentucky, Louisiana, Mississippi, North and South Carolina, Texas and Tennessee. There are now growers in 17 states. A highlight of the gathering was visits to select estates and research sites in Texas, Mississippi, and Louisiana. Hosts include the East Texas Tea Company, The Great Mississippi Tea Company and J&D Blueberry Farm. The gathering drew 40 to Brookhaven, Miss., during the five-day event with an additional 10 at the East Texas stop. “This group was actually a blend of old and new folks. We definitely are attracting new folks to our mailing list weekly and are kicking off a membership drive soon,” said McDonald, who mentioned two attendees from the U.K. including co-founder Nigel Melican of TeaCraft. “It is exciting to see more people getting interested in growing tea within the U.S.,” Dr. Guihong Bi, Assoc. 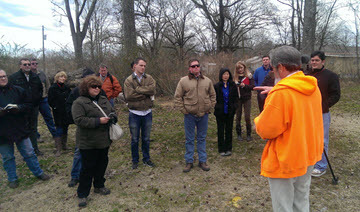 Research Professor of Plant and Soil Sciences at Mississippi State University, said of the tour. “Contacts that we have made through the USLTG have been invaluable in the development of our research objectives,” he said. USLTG maintains a website (www.usteagrowers.com) a blog and can be found on Facebook. Sponsors of the event include: Fairhope Tea Plantation (Fairhope, Al), Camellia Shop Nursery, Joy’s Teaspoon and SerendipiTea. Young Mountain Tea this week exceeded its Kickstarter goal ahead of schedule. The campaign has generated $26,000 with 12 days to go. It will be funded March 19. Founder Raj Vable contracted with Avani, a non-profit in the Kumaon region of Uttarakhand, northern India, to grow the bushes need to make white tea. 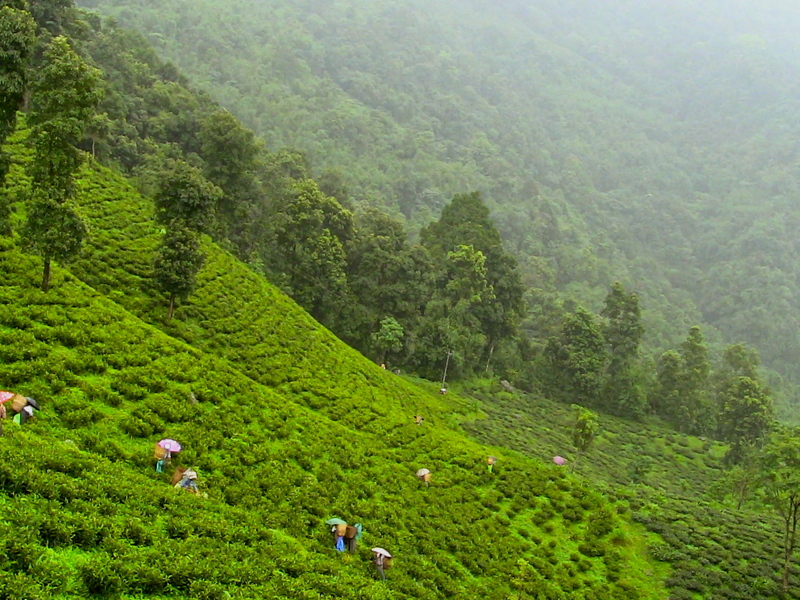 The steep hillsides of the Central Himalayas were first planted in tea by the British who later abandoned the gardens due to challenging logistics. Avani plants tea bushes in a grid that includes indigo and madder, which are sold as raw material to make natural dye, and with sericulture trees that support silk worms whose cocoons are sold to Earthcraft to make silk. The intercropping is a pioneering type of organic permaculture. The first harvest will be in May and made teas will be available late this year. Vable visited the region for extended stays and formed the company on his return to the U.S. He carefully planned the funding campaign aligning supporters well in advance. He first described his venture at the World Tea Expo in Long Beach, Calif.
“Participating in the New Business Boot Camp at the World Tea Expo gave us confidence and competency at a time when we needed both,” said Vable. “Equally important, it introduced us to the tea community, a welcoming and supportive group of people dedicated to combining their passion for tea with business.” To learn more: www.youngmountaintea.com. 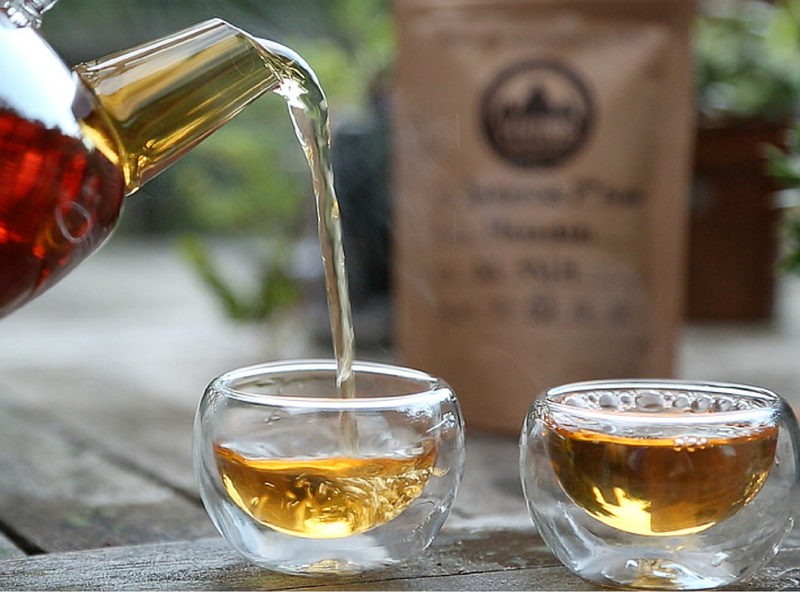 Adhiraj “Raj” Vable, founder of Young Mountain Tea, has turned to Kickstarter for support. His first selection is a white tea harvested in the Himalayas on land distant from the traditional high-grown gardens surrounding Darjeeling. The garden is near Beri Nag, India, grown on small plots in the Kumaon region that is still largely unchartered for tea. “We chose to create a new white peony, also known as a Bai Mudan, for two reasons. First, because it’s an incredible tea. One of the world’s most popular white teas, white peony is refreshing, light, and carries a sweetness reminiscent of honeydew melon,” said Vable. 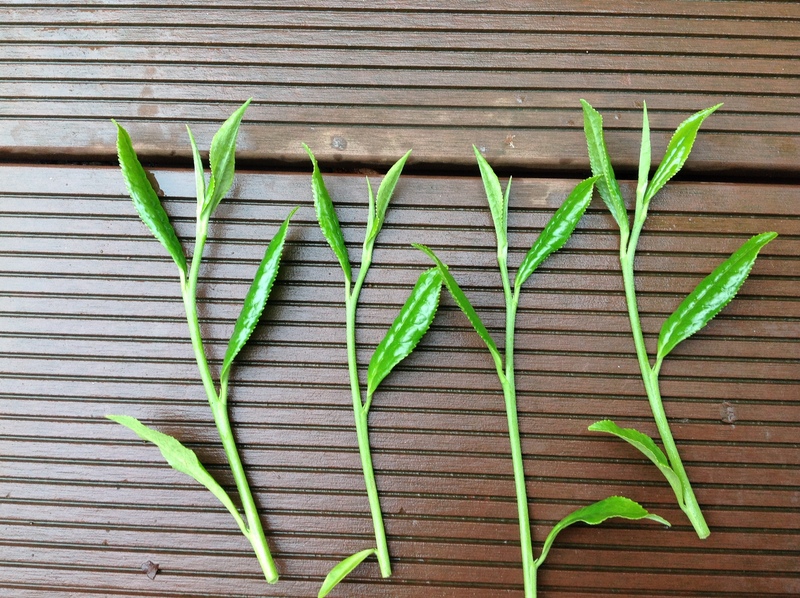 The tea is lightly processed, essentially sun dried which reflects the Chinese Bai Mudan style. “In June 2013, we harvested leaves from tea plants growing wild in Kumaon and processed it as a white peony. We were stunned by what we had, so we moved forward and planted our first acre. And now here we are, a few months away from sharing this gift of the mountains with you!” said Vable. This is an organic permaculture garden. The handmade tea is cultivated with sustainable intercropping practices in the foothills of the Himalayas near the border with Nepal. The region was first planted in tea in the 1820s but the British found it too difficult to transport given the terrain, absence of rail service and unreliable roads. Vable is getting good advice from experienced growers including Indi Khanna, the Nilgiri producer of bouTEAque teas. Vable has been planning this venture for several years. He is young, energetic and committed to assisting the Kumaon people who will find work that will help the next generation find reasons to remain in this rugged territory. He discovered the area as a graduate student at the University of Oregon while working with the non-profit group Avani. In 2013 he returned on a Fulbright Fellowship and negotiated with the Avani to purchase tea grown locally. Young Mountain is seeking $24,000 to fund the first phase of his ambitious plans. The project is nearing $15,000 with 120 backers and a month to go. To learn more visit www.youngmountaintea.com or Young Mountain’s Kickstarter page. Raelene Gannon is a tea sommelier, chef and now author of Tea from Cup to Plate, a guide to steeping and cooking with tea. The proprietor of Tea and All its Splendour, an online tea retail site and wholesaler, Gannon developed the recipes during two years of in-the-kitchen experiments drawing on her love of tea and food. Gannon is a certified tea sommelier in Canada, teaches cooking classes in and around Bradford, Ont., and has a great command of the delights of culinary tea (you should taste her delicious tea in chocolate). The illustrated text, priced at $29.95, is available now in print or downloadable ebook ($9.95) editions. Click to order. Today is International Tea Day… What’s in a name? In Hong Kong TWG is fighting not to lose its identity… Specialty Food Trends for 2015 reports its: Tea’s Time… Shapely Scotch jigger or teacup? Turks take offense at whisky peddler’s attempt to re-purpose the traditional bardağı…QTerra NOVO tea brewer launches on Kickstarter… Capital Teas are now available in Keurig-compatible cups. The global tea industry is now worth $109 billion, a reminder of the remarkable growth of the past decade. U.S. sales are expected to reach $25 billion by year end. Production has climbed dramatically since 2005 and consumption, which was up 5% in 2013, is keeping pace. In the United States tea sales grew an impressive 5.7% last year in grocery and department stores, according to the American Botanical Council’s Tea Market Report. The most important reason to celebrate is the overall benefit tea brings to millions of families world wide. In Kenya there are 560,000 smallholders growing tea. 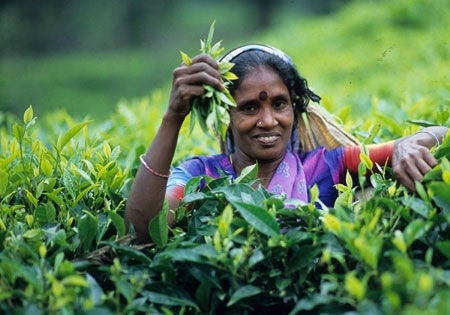 In Sri Lanka more than 400,000 growers farm small parcels to produce 76% of the country’s tea. Most of the tea grown in Indonesia, Vietnam and China farmed on small parcels by individuals who rely on tea as their primary cash crop. Comparisons are inevitable when it comes to coffee and tea. The world is neatly divided between tea drinking and coffee drinking lands. More coffee harvested annually but the tea industry employs more workers and has greater overall market value. The Food and Agriculture Organization (FAO) of the United Nations reports 8.5 million tons of coffee is produced globally, roughly twice the 4.7 million tons of tea but it takes 10 grams of coffee to make a cup of Joe and only 2 grams to make a cup of tea. Worldwide there are about three cups of tea consumed for every cup of coffee. Coffee is king in the Philippines but China is a tea-drinker’s paradise. Only 1% prefer coffee in China but the number of coffee drinkers is growing as coffee catches on with the young and more affluent Middle Class. Chains like Starbucks and Coffee Bean & Tea Leaf are rushing into the market along with European brands. While 44% of Americans drink tea, three-quarters say they prefer coffee. Australia is literally teetering between the two beverages with 50.3% of its residents stating a preference for tea versus 49.7% who prefer coffee. As to the question of which has greater health benefits, tea wins hands down but the ongoing debate is getting refined. If you rule that caffeine is a draw that since both coffee and tea contain caffeine (in differing amounts and available via different chemistry) there is scientific evidence of distinct health advantages in both beverages. Drinking three to four cups of coffee, for example, is shown to decrease an individual’s risk of developing type 2 diabetes by 25%. Click on this infographic from Policy Expert for a look (via Lifehacker). Whether you choose tea or coffee, remember to ease off on the cream and sugar as too much of either negates the most important health benefits in these beverages. The editors at Specialty Food News, annually predict food trends and tea once again made the list. Among her predictions are culinary cannabis, transparent labeling, “Super Bowls” for convenience and “Asian Food Roots” as consumers reach beyond Chinese, Japanese, and Thai to discover new regional foods, from Vietnamese to upscale ramen. No. 5 on the list is: Tea’s Time – Tea is getting the high-end treatment from ingredient upgrades to elegant cafe experiences. “Sweetener High” follows: Customers are swapping added sugars for alternative natural sweeteners including stevia, maple syrup and honey. Our recent review of successful tea projects on Kickstarter drew a lot attention. 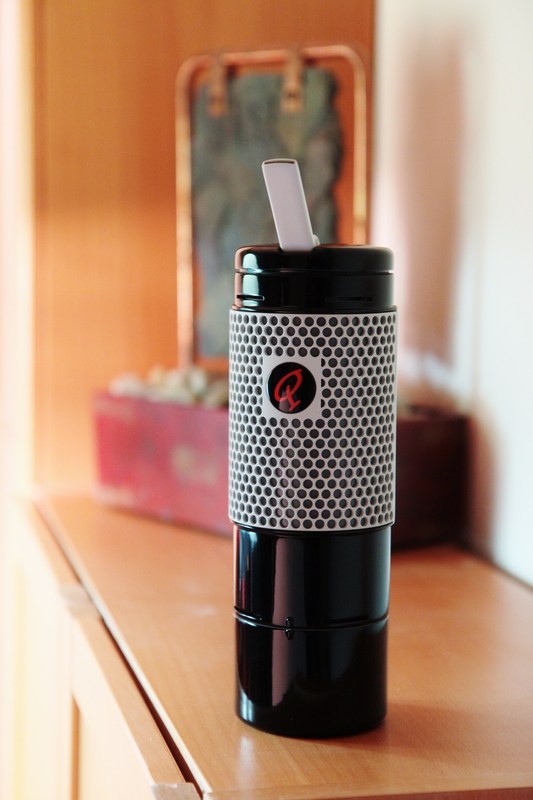 Inventor Pierre Baston was just about ready to launch when Tea Biz posted so I’m grateful to Alexis Siemons for bringing the QTerra brewer to our attention this week. Baston of Philadelphia was inspired by the mate gourd and straw (bombilla) used by Argentinians. Unlike a typical travel cup, the QTerra is a portable tea brewer that makes it possible to steep loose-leaf tea multiple times using varying amounts of water stored in an internal reservoir. The diagram at right shows how the “CoolStraw” technology draws from the brewing chamber. Tea drinkers on the go can fill the brewer with hot water and dry leaf before leaving for work. The insulated water reservoir stays hot for hours allowing you to steep the tea later on the subway, train or in the car. The water is released by push button providing additional control critical for green tea drinkers who prefer a short (gongfu style) steep with small quantities of water and lower temperatures. The CoolStraw is constructed of material that lowers the temperature to 140-degrees Fahrenheit, absorbing heat and preventing spills. The inventor hopes to generate $150,000 to pay for molds and manufacturing expenses. There are two weeks to go in the funding cycle. If successful the brewer will go into production in November 2015. Backers get brewers and tea samplers and a vote in determining the production colors. The brewer is eco-friendly, BPA-free and sturdy. The suggested retail price is $79. Turks enjoy their tea like few others. The country’s per capita consumption tops 10 cups a day, that’s 13.8 kilos a year. 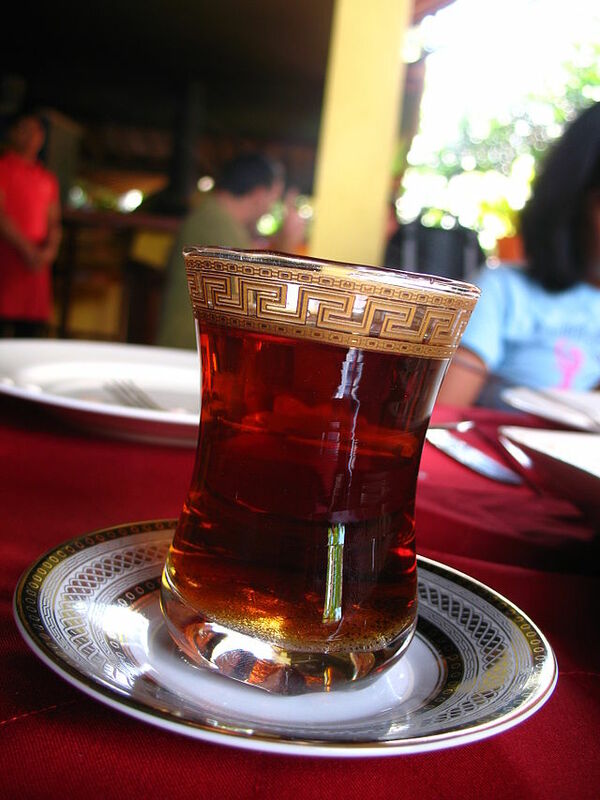 Turkish tea drinkers prefer a black tea sweetened with beetroot sugar. Their glassware is just as distinctive as their brewed tea. Recently these slender waist glasses were the at the center of a teapot tempest reported by the Hurriyet Daily News. The paper reported: “Pious Turkish tea junkies are upset after glasses identical to the traditional, Anatolia-bred “slender-waist” cups were marketed as “the perfect whisky glass” by a U.S. spirits company and sold online. Many Turks avoid alcohol due to their religious beliefs. “Keen-eyed Turks were not deceived by such promotional ‘plagiarism’, ” according to the newspaper. The glasses sell for $25 each online but you “can find them sold for a fraction of that price in almost any Turkish market,” writes the Hurriyet Daily News. The bardağı, as it is known, is a very practical design for serving hot drinks. The flared top makes it easy to sip and the tea in the top portion of these 100-gram glasses cools faster than tea in the bottom which retains heat longer than a conventional tea cup. A Hong Kong appeals court has ruled that Singapore-based TWG Tea Company can no longer use the name TWG in business dealings. Owners of TWG Tea (HK) Company argued that allowing TWG to continue operating its premium tea shops would lead to confusion that harmed the Tsit Wing Group, a tea wholesaler founded in 1932. TWG, which stands for The Wellness Group, must now change its business identity in Hong Kong, including the display of its distinctive trademark on tins, signage, literature and packaging. It first began operations there in 2011. TWG operates a premium tea lounge in the IFC Mall. An attorney for TWG said the company registered a TW logo as “Plan B” and Tsit Wing Group has not voiced any objections. Packaged Facts estimates sales of tea in capsules account for approximately 10% of dry tea sales this year. Sales of capsule tea grew 32.8% to $138 million in 2013, surpassing packet tea. Capital Teas just released five flavors in Keurig-compatible capsules, priced at $12.95. The cups “marry the nuanced and distinctive flavors of a premium loose tea, replicated in a form that can be brewed consistently with a Keurig® in two minutes or less,” according to the company. 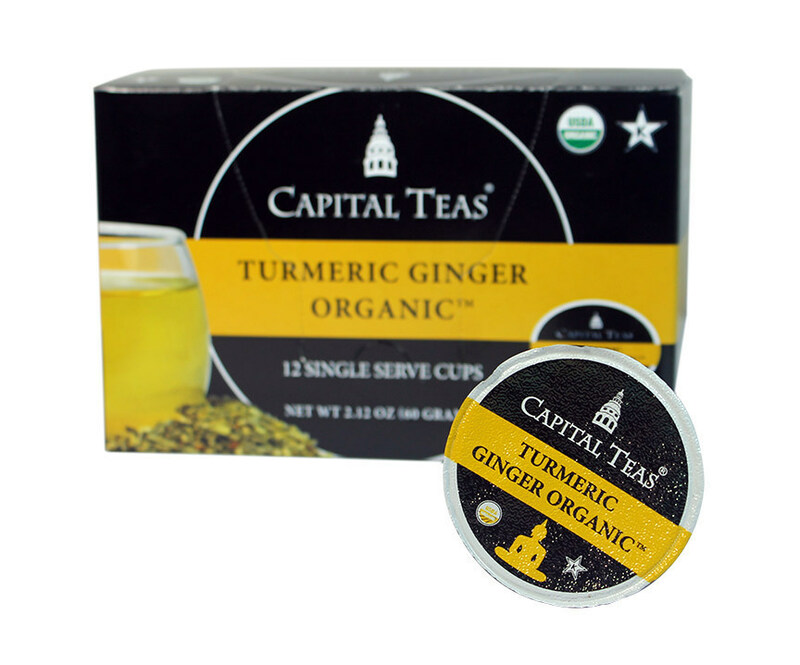 Packs are available on Amazon at http://www.capitalteas.com and at Capital Teas’ 13 locations. Tea Biz serves a core audience of beverage professionals in the belief that insightful journalism informs business decision-making. Tea Biz reports what matters along the entire supply chain, emphasizing trustworthy sources and sound market research while discarding fluff and ignoring puffery. The last decade has seen a boom in what the industry calls ‘Specialty Tea’, but if you ask for a definition you will come away confused. What is so special about ‘Specialty Tea’? Not much. A close examination reveals commodity tea that has been adulterated in some way, typically by blending ingredients such as pieces of fruit, exotic herbs or flower petals. Since the ingredients are dried, tea blenders spray (yes, spray) on lots of flavor. I’m using the word “commodity” to include any large-scale tea where the production goal is quantity over quality. There are great quantities of traditional tea growing in every tea producing country. These include green tea, puer tea, wulong tea, white tea well as black tea. There are also an endless variety of herbals incorrectly labeled teas. Why set standards for ‘Specialty Tea’? Without standards, the market faces chaos. Where would France be if it had not established standards for wine almost 500 years ago? Italy followed suit and prospered. Stop and think, would the debate over which is better — Italian or French wine — have turned out differently if the Italians had been the first to set standards? It’s important to understand that standards not only define products, they establish markets, and whoever defines a market, controls it. It is undebatable that the French have created admirable markets for their wine, as have, more recently, specialty coffee retailers. Nowadays, tea is whatever the merchant says it is, opening a lot of ground for dubious interpretation. In contrast, standards are consistent and independently verified. The specialty coffee industry has done an excellent job of establishing standards, which has lead to levels of excellence and increased profitability enjoyed by the entire coffee industry. Coffee and tea both began as rarities for the rich, evolved into commodities for the masses and are gradually becoming artisanal offerings – the choice of connoisseurs. Everyone my age remembers that back in the day, coffee was either the Red Can (Folger’s) or the Blue Can (Maxwell House). There were neighborhood diners and corner cafes where a cup of coffee cost a quarter. This was coffee’s “First Wave.” Americans annually drank an average of 10 lbs. of coffee per person. Per capita consumption was measured by the gallon because the efficiencies of the commodity model made it cheap. The turning point was 1974 when independent coffee shop owners established a standard for “Specialty Coffee.” The adoption of standards launched the “Second Wave.” Pioneers such as Alfred Peet at Peet’s Coffee & Tea, Starbucks, and Coffee Bean & Tea Leaf would not exist without these standards. Innovations in growing, sourcing, roasting, packaging, and coffee brewing followed. The market for specialty coffee was more sophisticated, resembling its European counterparts. Coffee of this quality command a higher price; it no longer had to be cheap. Thus “quality” coffee became easily distinguishable from commodity coffee. The term “Third Wave” was coined around 2002 when small coffee businessmen traveled to coffee farms to source direct and eventually became experts in every aspect from growing to roasting to brewing. This took the small retail coffee businesses to a new profitable level that could differentiate itself from the like of Starbucks and company. Once in control of the entire supply chain, not only did standards raise retail margins for retailers, the discovery of great coffee also opened the door for a respectable wholesale business selling to other quality businesses whose business models did not include working the complete supply chain. The “Third Wave” aspires to an even higher level of coffee experience. It begins with direct sourcing. Only direct sourcing can insure quality and answer questions about fair trade and farming methodology with confidence. Third wave coffee also places high value on production and preparation: the goal is to get the best possible cup. Third wave coffee owes its existence to Starbucks for building the market for better coffee, and for establishing the benchmark. Retailers exceeding that level could not profit in the market that Starbucks created. Third Wave roasters realized they needed to get a whole lot better to beat Starbucks, and to do so they needed expertise and transparency along the entire supply chain. Similarly, two years ago Starbucks changed the tea market dramatically for small independent tea businesses when they bought Teavana. From here on, every small tea business is going to be defined in relation to the nearest Teavana, like it or not. The difference between coffee and tea is that there are no standards that give tea business the tools to beat Teavana. Starbucks redefined the market for coffee on almost every level. They will do the same for tea. Small tea businesses and major tea corporations alike are going to feel the heat. Without standards, Teavana, with its extraordinary marketing muscle, can define tea quality any way they want. If standards for specialty tea mirrored the standards for specialty coffee the only tea that could quality as “specialty” is tea judged to be within the top 20%. Most of the tea sold as specialty tea in the West would be disqualified. Just as there is with coffee, few multimillion dollar companies are going to support standards for quality in the tea industry. In the spring of 2014, Jesse Jacobs of Samovar Tea, wearing a cream-colored canvas apron over a fashionable t-shirt, announced the coming of the tea industry’s Third Wave. But can the tea industry really be on the verge of entering into a movement equivalent to that of the coffee industry? Even though both tea and coffee have the Starbucks Corporation in common, it is going to take the tea industry a very long time to catch up to the sophistication of the coffee industry. The discussion about standards for ‘Specialty Tea’ has not even begun. Looking forward, a profitable market for small tea businesses will require standards. These need to be objective, understandable, and replicable. Standards provide growers with a definable goal for crops and harvesting. Standards enable tea makers to formulate products clearly identified by buyers, which give the producers incentive to get better. Direct sourcing will become increasingly important for the tea businessman. Consumers will actually know what they are paying for and where it originated. Establishing standards brought extraordinary advantages to coffee growers including unimaginable financial success. A small Brazilian coffee grower this month won the Alliance for Coffee Excellence’s 100th Cup of Excellence (COE) competition to earn $50.20 per pound at auction, the highest price ever paid per pound for COE coffee. He took home $106,000 in a country where the per capita income is less than $1000 per month. What is noteworthy is that Brazil is the largest commodity coffee producer in the world. Think what standards for quality would mean for small holders in India and Africa, areas still economically strangled by the colonial commodity system. Establishing an objectively evaluated standard establishes value that can be communicated thru the supply chain to the customer. Excellence is the reward. China is realizing the benefits of standards in its domestic market for tea right now. Their tea industry was destroyed through a 150 years of war and internal strife. As China recovered following World War II and the Mao era, tea was mediocre at best across the country. More than a decade ago China set standards for quality and freed tea makers to create and profit from their own business. Since then, China has experienced a renaissance in tea making: tea being produced for the domestic market is the best it has ever been in history; China has become the largest tea producing country in the world, gets the highest prices for its tea, and has the highest average price for tea. China has the best teas in the broadest categories; it has defined standards, and grows the largest percentage of tea using traditional, chemical free growing practices. The coming of standards is inevitable. Small businesses that are dedicated to quality in real terms, not just in the marketing of their products, will benefit. It took years for standards to impact coffee, but things will move quicker with tea due to the benefits of the information age. The tea industry is ready for professionals to lay the groundwork for “Third Wave” tea. 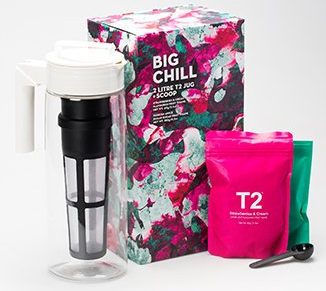 Let’s leave it to Teavana to push the second wave along in building the market, like their parent company did. What is great about getting the ball rolling towards standards for quality and, eventually — excellence — is that small businesses that are struggling to establish new business models need not worry, for the best practices for quality in the tea industry go beyond the reach of corporations, economies of scale, and deep pockets of marketing departments. Standards are the essential tool for the tea entrepreneur. So become a pro, take some Chinese classes, and get you passport up to date, and by all means study the Specialty Coffee Industry. They have become experts in coffee on every level. You might want to remember that this year Peet’s hired a woman that is fluent in Chinese and has a masters degree in tea from Zhejiang University. Standards, direct sourcing, transparency, expert level knowledge about tea and its culture, logistical mastery, inventory management expertise, and tea preparation skills are all requirements for ushering in tea’s third wave. Herein lays opportunity, challenge, and the promise of excellence. Let’s hope tea entrepreneurs’ passion for tea is strong enough to take them where they’ll have to go. Tea Biz posts are available to use in your company newsletter or website. License reprint and distribution rights for single articles or commission original content. Click here for details. No matter how deep you travel into tea country, India’s 900 million cell phones are readily visible. Whether riding in rickshaws, farm trucks or bajaj (tricycle taxis) tea workers, especially young tea workers, rely on their cells as much as their peers in urban settings. 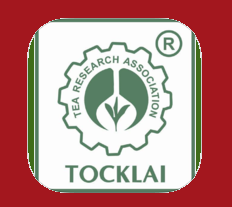 That is why the Tocklai Tea Research Institute, the hub of India’s Tea Research Association (TRA) created an iPhone and Android application that gives ready access to the oldest and largest tea research and development organization in the world. Tea farmers can get answers in real time. They can select images of pest damage taken by their phone camera, for example, upload the image and the team at Tocklai will recommend the proper action. Phukan said the application enables researchers to connect with small holders who can study Agronomy, Botany, Engineering & Manufacturing, Meteorology, Soils & Fertilizers and Water Management & Irrigation. The application also includes sections with very specific instructions on how to identify and deal with plant diseases, pests and weeds. The encyclopedia of research & development alone contains 1,000 pages of information. Tocklai Experimental Station was founded in 1911. It became a part of TRA in 1964. Researchers there are in the forefront of developing drought-resistant tea cultivars; improvements in tea cultivation and processing. The institute is part of a network of 1,076 tea estates covering 6 million acres of Assam, Tripura, Dooars, Darjeeling and Terai. You can download the Tocklai App for iPhone here or download the Android version here. Keyway Innovations in Hong Kong and Shanghai recently introduced the Qi teamaker, the world’s first app-enabled kettle with a unique brewing system. “What makes the Qi teamaker truly unique is its patent-pending brewing system that does not use a water pump or mechanical agitator to create the necessary water flow. 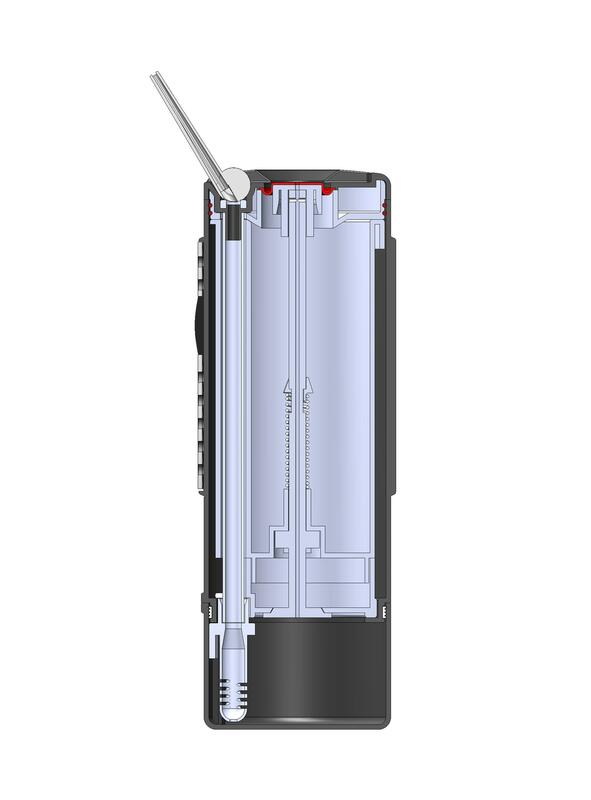 This allows for a hassle-free automatic brewing process with simple preparation and cleanup,” writes Rick Ha, PhD, Founder and Keyway CEO. Press the correct temperature setting for floral, green, black, oolong, or iced tea (cold brewed). Next, select tea strength. The hot water flows over tea placed in a basket in the top of the teamaker and into the clear glass body. 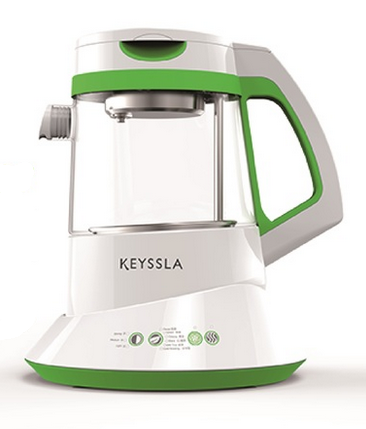 The kettle regulates water temperature, brewing time, and water flow and tea leaf expansion. It even makes bubble tea and milk tea popular in Asia. Pre-set temperatures range from 75- to 95-degrees Celsius and brew times range from 2 minutes to 10 minutes. 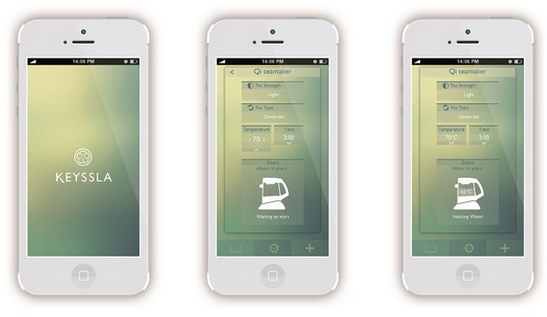 The smartphone application enables tea drinkers to customize the auto sets. The kettle is easily disassembled and cleaned. I’ve been watching the progress of the design team now lead by Nicholas Roux for the past three years during which the prototypes have steadily improved. 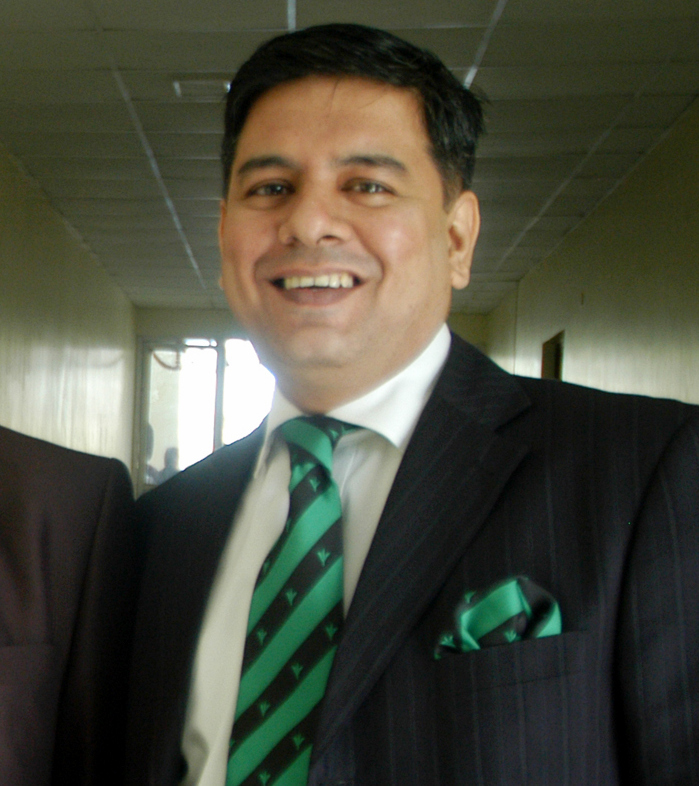 The project dates to 2010 with Keyway Innovations launching in October 2012. The Kickstarter project has generated $25,000 in contributions toward its $100,000 goal (as of Dec. 7) with 17 days to go. A $149 contribution earns backers a Vita model and for $199 Keyway will send you the Maestro model, expected to retail for $249. Speaking of Kickstarter, here is Katrina’s report on how tea ventures are faring in the crowdsourced financing arena. In the past, future entrepreneurs saw their path forward as finding people with deep pockets – friends, family, investors – and the way to reach them was through dozens of meetings and personal contacts. Then came Kickstarter. Kickstarter was launched as a way for individuals to share their creative projects online and to solicit small contributions from people who believed in their vision. The person seeking funding describes their project and establishes a funding goal and deadline. If the goal is reached, the project designer gets the money. To date, 73,000 projects (44% of concepts presented) have been funded. Tea entrepreneurs have embraced the concept with new projects that include the launch of tea bars, new product lines and special projects. Atlanta tea blender K-Teas needed funds to get FDA approval for their teas and blends so they could expand beyond local markets to national distribution. They launched their project on September 19 and by November 1 they had the support of 191 backers who helped them surpass their $5,000 goal by nearly $1,500. Frank Horbelt from Zoomdweebie’s Tea/52 teas turned to Kickstarter several times this year, with four successful efforts raising nearly $35,000. In Horbelt’s first campaign he hoped to raise $500 for a label dispenser to make his new iced tea line more efficient to produce. Supporters came up with almost $18,000. Since that time he has raised money for custom printing projects, a packaging machine and exhibition fees for World Tea Expo. Loose Leaf Tea: Sip & Slip into the Leaves of a Story – Raised $5,070 (against a goal of $2,500) Development of a tea line with fairy tale themes. The launcher hopes to open a fairy-tale inspired tea room someday. The Honeysuckle Tea House – Raised $21,638 – To open an apothecary cafe, selling tea, kombucha, herbs and smoothies with a focus on wellness. Sense Asia Co. has released a gift set and tea sampler called “Taste Vietnam.” The boxed set features 32 artisan teas organized by function. 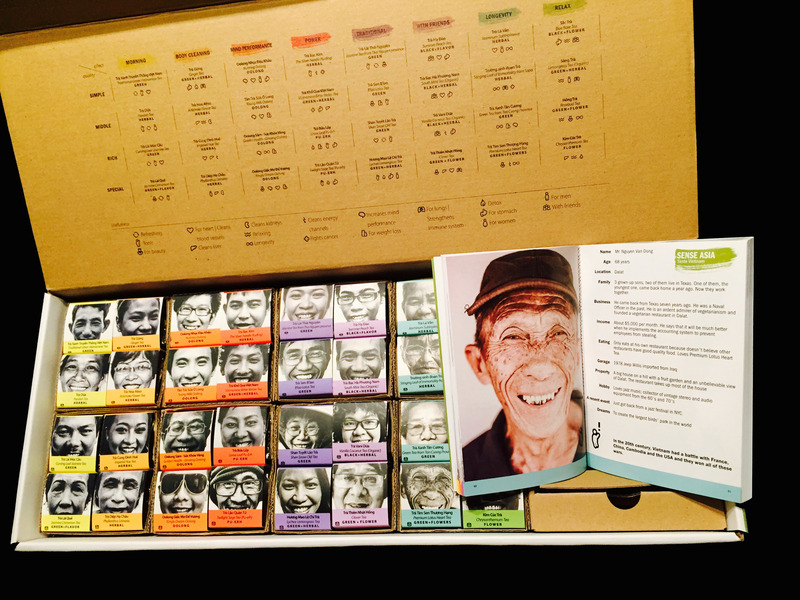 A grid printed inside the box lid presents four teas in eight categories: morning, body cleaning, mind/performance, power, traditional, with friends, longevity and teas to relax. Along the x-axis at left the tea is further classified as simple, middle, rich and special. Each sample is packed beneath the smiling face of growers and tea lovers along with those employed in various businesses. The mosaic of faces is telling. Some are quite young, others worldly and wise. They include seasoned masters, busy executives and several women who reveal their love for tea. The selection includes tea and herbal blends, herbals and traditional tea. Since these teas were mainly selected for their health benefits, most are green but the box also holds oolong, pu-erh and a couple of black teas. The container brews 965 cups of tea, too many for me to evaluate since the box arrived last week but I tried several including the plastic sealed, gold foil wrapped small brick of pu-erh made by Bui Thanh Dung, an 82-year-old grower with 23 grandchildren and 12 great-grandchildren. He lives at Dak Lak and grows eight types of tea and enough vegetables, pigs, cows and chickens to feed his extended family. The tea brewed richly red-brown and sweet with forest-floor aromatics and pleasant, lingering aftertaste. The tea held up nicely through multiple steepings. I learned about this grower and many other ordinary and extraordinary Vietnamese in a fascinating booklet enclosed with the tea. The collection is the work of 26 tea professionals who traveled 72 days in Vietnam, tasted 346 teas and interviewed 343 individuals from 28 farms and 17 towns and villages in both the north and south tea growing regions. Their subjects include dentists and fishermen, a fashion model, a cab driver, café owners, an engineering professor, and a bicycle racing champion with 220 bicycles in his garage. They range in age from their teens to 92 years and all love tea. The authors worked eight months on the project which resulted in the tales and curated selection of teas, most of which cannot be found in supermarkets or tourist shops. The booklet is published in Russian, Japanese, Korean, French and Chinese. “We hope that while spending time in the company of family and friends you will enjoy these delicious teas, and gain a deeper understanding the beautiful and welcoming country of Vietnam,” write the authors. There are hundreds of variants of the word tea and cha. Did you ever wonder why cha became the preferred spelling in places like India while tea and thé and tay are preferred in Europe and the Middle East? “The word for tea in a country’s native language gives us an idea of how tea arrived at that country,” writes Stacey Geoffrey Tay in Quora. The Amoy spelling tê originated in southern Fujian province and reached the West through the port of Xiamen (Amoy). 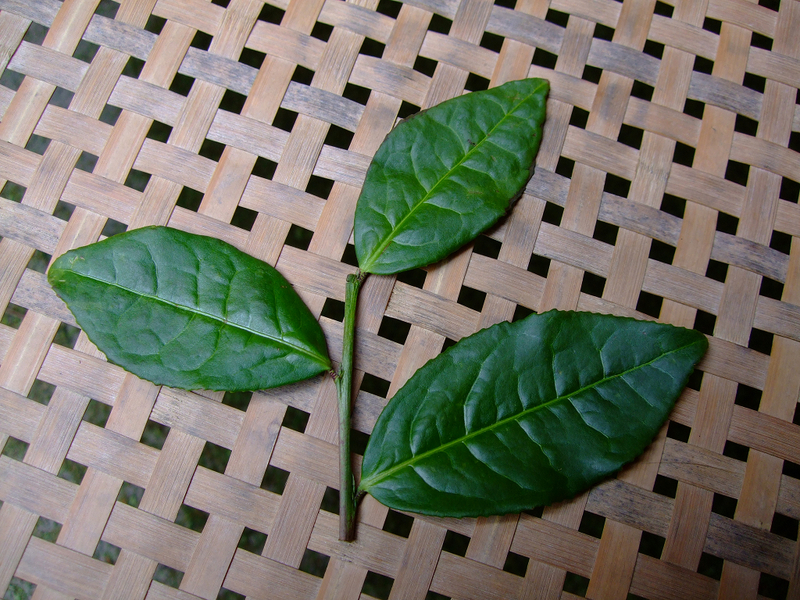 Hokkien varieties of tea from the Southern coast of China and in Southeast Asia were grown by farmers who pronounced it teh. Cha is from the Cantonese chàh of Guangzhou (Canton) spoken in the ports of Hong Kong and Macau where Portuguese shipments to India originated. The Mandarin chá was the name for tea that traveled overland to Central Asia and Persia. ABC’s terrific tea tally… consider a Confederation of Tea Smallholders… Unilever’s first T2 opens in New York shop…. Guinness awards certificate for biggest tea bag… elegant teapot design updates ancient Chinese masterpieces. Everyone in tea will want to study the American Botanical Council’s newly released Tea Market Report. It is the most thorough analysis of the American tea industry sales by channel I’ve seen. The report, which appears in the November issue of the American Botanical Council’s HerbalEgram, is authored by Sage Group principal Brian Keating and ABC Executive Director Mark Blumenthal with Ash Lindstrom and Mary Ellen Lynch, SPINS director of consumer insights. Sales of tea (loosed, bagged, concentrated and herbals) grew by 5.9% in the U.S. in 2013 reaching $1.7 billion while ready-to-drink teas in mass market, natural and specialty gourmet channels remained flat at $2.4 billion compared to 2012. Total RTD sales including convenience are estimated at $5.1 billion in the report which cites a Canadean study predicting RTD tea will grow by 6% to $5.3 billion in 2014. The authors predict “a banner year” for both brewed and RTD tea sales in 2014. The significance of their work is the breadth of sales channels covered. Herbals and medicinal teas are tallied as well as chai and Rooibos. These are important, fast-growing categories that can be difficult to research. Chai in bags grew 21.4% compared to 2012 across all channels while Rooibos sales are up 3.5% in bags and 11.1% in loose leaf. ABC’s first tea market report includes 12 tables covering mainstream, multi-outlet, natural and specialty/gourmet channels along with details on niche categories that include organic, Fair Trade teas and non-GMO labels. A significant advantage to this report is that it brings to light data on the herbal segment. The top selling herbal is chamomile with 2013 sales of $48 million, followed by mint infusions which earned $35 million and ginger which brought in $3.8 million, a distant third. Medicinal tea in bags enjoyed sales of $177 million. Even packaging is documented with sales in cardboard boxes accounting for $1.1 billion of all tea and canisters grossing $276 million. Conventional packaging is challenged by tea in capsules and pods which saw a 32.8% increase in sales in 2013 to $138 million surpassing packet tea for the first time. ABC plans to present its 2014 annual tea market report in HerbalGram issue #105 (January-March 2015). Every two years the United Nation’s sponsored Committee on Commodity Problems, under the Food and Agriculture Organization (FAO), takes a close look at tea. This is because the $90 billion tea industry employs close to 15 million people and provides critical trade dollars essential to the stability of several countries. The Intergovernmental Group on Tea (IGG) brings together delegates from all the producing countries. These include government employed agricultural officials, tea board directors, research institute directors, tea association managers and tea executives from the larger brands. The IGG met in Bandung, Indonesia earlier this month. Climate change, the harmonization of Maximum Residue Levels (MRLs) and the challenges facing tea smallholders were on the agenda along with a discussion on how to increase consumption in producing countries. The group also heard a report on Codex Committee on Pesticides Resident (CCPR) will now recognize and accept that there is an alternative method with scientific merit for establishing MRLs in tea. The CCPR invited tea-producing countries to submit reports containing scientific evidence to establish safe levels of residue in brewed tea. I will tackle all these topics in the weeks ahead but today the discussion I find intriguing is establishing an International Confederation of Smallholders. Smallholders are the fastest growing group of tea producers accounting for roughly 9 million of the 13 million tea workers and 60% of production. As the colonial model of estates crumbles in many countries smallholders will be responsible for growing most of the world’s tea. In some countries smallholders grow most of the tea, but often account for only a relatively small slice of the high-paying premium teas for export. India, Indonesia, Kenya and Vietnam are all working to improve the skills of smallholders to the point where they can sell direct to Western markets, ideally through cooperatives that provide efficiencies of scale and quality control. At Bandung this discussion coalesced in a motion to establish an International Confederation of Smallholders identified by a global brand that will help retail customers better understand the contribution made by small tea growers. The decision may encourage commercial tea brands to inform customers that all or some portion of their product comes from small family-owned gardens. This is not a cumbersome third-party certification, it simply expands on the idea of traceability and provides an incentive to brands that market to consumers aligned with the idea that smallholders should be encouraged to make better tea. 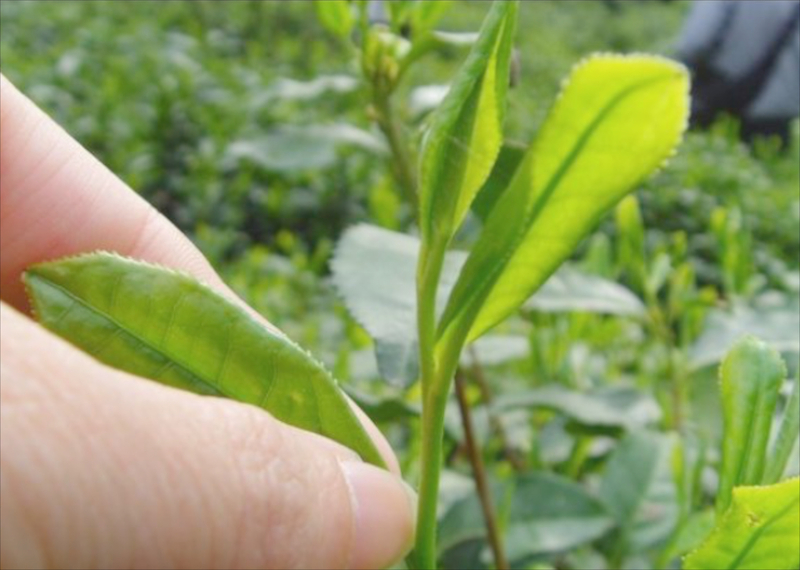 In China, where 80% of the workers are small holders and only 20% work on estates, the finest teas are produced by smallholders who get top dollar in both the local and overseas market. Once organized as is done in Kenya, this could be a winning model for the world. Comment below if you think this is a good idea and I’ll start a Linked In group discussion. Last month Unilever opened the first of its Australian-based T2 tea shop on Prince Street in New York’s SoHo. The shop was warmly received and remains busy a month after an opening night party that brought founder and managing director Maryanne Shearer into the limelight of America’s specialty tea scene. New York has witnessed a surge of high-end shops including French Le Palais des Thes’. In April T2 opened a shop in London. Kevin Havelock, Unilever president for refreshments, said that the company intends to build hundreds of T2 locations, expanding on the 40 in Australia and clearly not limiting its domain to the Asia-Pacific region. Sales in conventional channels declined for Lipton, Unilever’s top brand, while specialty offerings gain momentum. Marketers point to the fact that 1.8 billion people will move into the ranks of the middle class by 2020, many in tea drinking cultures. There are also signs of a lessening enthusiasm for coffee shops in Western Europe and renewed expansion of specialty tea shops in France, Poland and Germany. 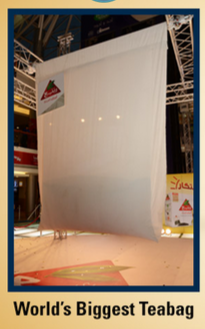 The British fittingly held the Guinness World Record for the largest tea bag until last week when an enterprising Arab firm took the prize. Rabea Tea, a Saudi brand manufactured by Ahmed Mohamed Saleh Baeshen & Co., created a tea bag weighing 250 kilograms, enough to make 100,000 cups of tea. The bag, held aloft by steel truss, measures 13 feet by 10 feet (four meters in height and three meters width). The event coincided with the launch of the company’s full leaf tea bags, which required a decade of research and development. Once certified in Jeddah the bag began a tour of Saudi cities Riyadh and al-Khobar before the tea was donated to charities. A report in PSFK notes that despite its rich history and cultural significance, Chinese tea culture is being slowly eroded by contemporary culture. Instead of fighting this trend, the Guanfu Museum in China commissioned Jeff Dayu Shi to design a series of nine unique teapots and a highly crafted bamboo chest. Each teapot corresponds to a different tea and method of preparation, all packaged in a way that appeals to younger generations. All of the pieces incorporate functions and aesthetics perfectly. Color transformations that occur as the result of substance changes during the heat and curing treatment have to be carefully managed by a skilled craftsmen with years of experience. 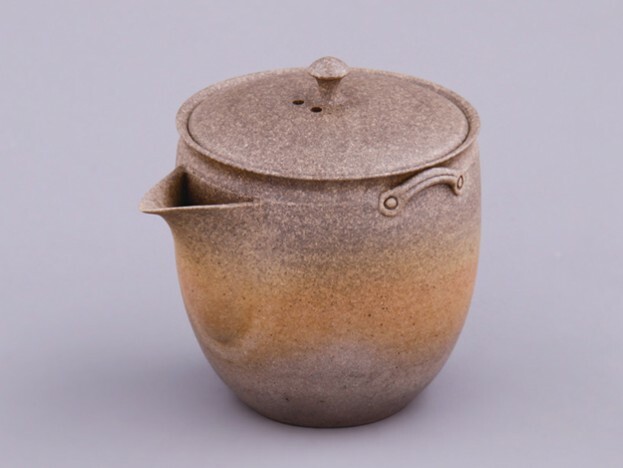 Inside the pots, there is even a beehive structure with tiny sesame-sized openings that enhances the flavor of certain teas by facilitating filtration. All of these teapots are housed in an expertly-crafted bamboo chest used a traditional Chinese tiered handle case as its inspiration.